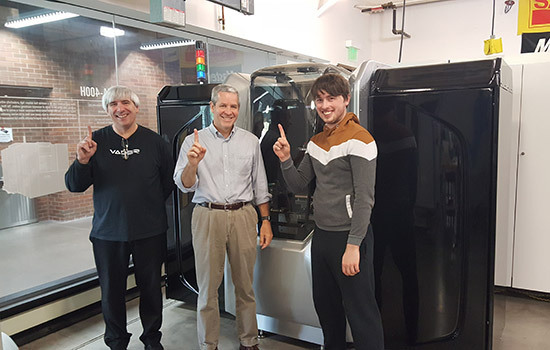 Vader Systems’ first Mk1was delivered to the AMPrint Center at RIT in early June. On hand for the delivery and installation of the innovative Magneto jet liquid metal 3D printer was Scott Vader, company president; Denis Cormier, director of the AMPrint Center; and Zack Vader, company chief innovation officer. High costs of powdered metals and the need for 3D printing/additive manufacturing equipment that can accommodate these materials are challenges that are being met by Rochester Institute of Technology and Vader Systems through a university-corporate partnership at RIT’s AMPrint Center. RIT installed the first Mk1 liquid metal 3D printer from Vader Systems in the AMPrint Center in early June. The university-corporate partnership is integral to the growing 3D printing/additive manufacturing initiatives taking place in New York state, and research into further enhancements to an already innovative system is underway, specifically in the area of new materials processing and system design. Working with AMPrint Center researchers, the company expects to further enhance this notable manufacturing technology, said Denis Cormier, director of AMPrint—the New York State Additive Manufacturing and Multifunctional Printing Center. “It is our job to try to help companies like Vader be successful, and I think they’ve got a phenomenal new technology that’s completely different than any other process out there,” said Cormier. Vader Systems, a Buffalo-based high-tech company, developed its novel liquid metal 3D printing process using a faster and more cost effective approach than existing technology. Its Mk1 is a molten-metal, drop-on-demand printer—similar to an ink-jet printer—used to create 3D-printed objects made of an aluminum alloy. The standard way of printing 3D metal parts today is to use powdered metal alloys which are fused using expensive lasers. Powdered metals tend to be expensive and the fusion process is lengthy. Using the Mk1 system, an aluminum alloy is liquefied in a high-temperature ceramic chamber and deposited layer by layer, through a precision, ceramic opening. Working together prior to the installation, the team from RIT and Vader arranged a machine modification that allows the system to integrate slightly larger wire that is approximately one quarter of the cost of wire being used previously. This improvement resulted in a 75 percent reduction in raw material cost. Both Vader Systems and AMPrint Center researchers will continue to update Mk1 capacity, specifically exploring expanded use of metals including high strength aluminum alloys as well as higher temperature aerospace materials. They also will address improvements to the equipment which is considered breakthrough technology because of its high-speed processing and lower cost to produce parts. Projects underway include, but are not limited to, qualifying new aluminum alloys, research and development on higher temperature metals such as copper, and working with Vader System staff to develop a multi-nozzle jet printer. The research and development of these capabilities could provide companies with cost-effective alternatives to using titanium to produce parts that could potentially have similar high strength and light weight capabilities, said Cormier, who also serves as the Earl W. Brinkman Professor in RIT’s Kate Gleason College of Engineering and a national expert on 3D printing and additive manufacturing. Expanding its current single-nozzle application process to a multi-nozzle version, the Vader system could tip the process toward main stream production because the cost gets low enough on a per-part basis, said Cormier. The AMPrint Center is among the first research labs to focus on development of next-generation multifunctional 3D-print technologies, materials and devices. The process can be used by multiple industries including automotive, healthcare and electronics. “Partnerships between businesses and academia, like RIT’s acquisition of the Vader Systems liquid metal 3D printing system, solidify the Finger Lakes region as a core for advanced manufacturing and imaging technology,” said Howard Zemsky, Empire State Development president, chief executive officer and commissioner. The center opened in October 2016 at Rochester Institute of Technology, and with its university-corporate partners is conducting research and development in 3D printing and additive manufacturing, an industry seen as a key economic driver for the Finger Lakes region, New York state and the U.S. The region is considered a 3D-printing “ecosystem” because of the expertise in print materials, print process systems design and high volume sales and distribution channels and flexible electronics. Vader Systems was founded in Buffalo, N.Y., by a father/son team driven to create a lower-cost, true production solution for metal 3D printing. Their dream was realized with the Mk1 Experimental, featuring patent-pending Magnetojet technology. The Mk1 inputs stock metal wire, and jets high-speed molten metal droplets using a combination of resistive heating and electromagnetic propulsion. This ground-breaking and scalable technology is capable of achieving fully-dense parts and is well-suited for a variety of industries. Vader is currently printing with aluminum alloys 4043, 6061 and 7075. Future development will include additional metals as well as multi-nozzle printers. More information can be found online at www.vadersystems.com.